ZACH’s ROOM: a loft bed doubles narrow space. 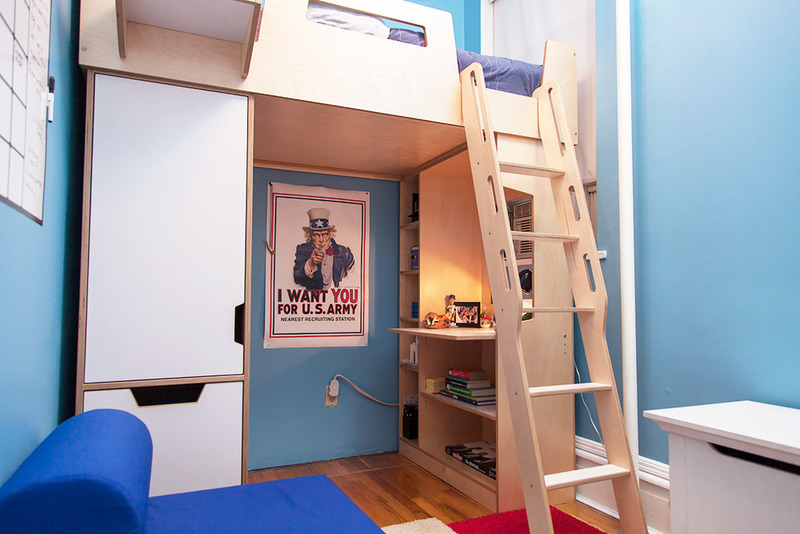 To optimize the narrow space in Zach’s room, we customized a Casa Kids Dumbo Loft Bed. We created a sleep and work solution along the back wall, allowing the rest of the room to remain open. Natural wood combined with white accents display a neutral look suitable for an older child. The finishes were chosen to keep the room light, and compliment the blue accent walls. Since the room has a small closet, the space under the loft bed includes three tall and deep storage units for clothes and a hamper. A hanging tray serves as a nightstand and can easily be repositioned if desired. The loft bed features a ladder with ergonomic cutouts that provide easy gripping points, ensuring that climbing up and down is safe. The opposite side features a desk to be used for school work, and open storage for books and other items. We included a cut out in front of the desk to accommodate the a/c and make for a more open feel.